Shop signed Sergio Garcia golf memorabilia featuring genuine autographs from the great Spanish golfer! Signed Sergio Garcia golf balls, clubs, shirts caps & photos. All with free UK delivery, worldwide shipping and Certificate of Autehnticity, many with signing proof! He’s one of the biggest names in Spanish professional golf – a prolific player with no less than 31 tournament wins under his belt. Sergio Garcia or ‘El Nino’ as he’s known to fans and friends plays on the PGA Tour and has spent much of his professional career positioned within the top 10 of the Official World Golf Ranking. The highest position reached was 2nd, after his HSBC Champions Tournament win in 2008. Garcia began playing golf aged just three years old. He was taught by his father, Victor – who was himself a club professional. After winning his first club championship at the age of 12 he set a world record when he became the youngest player to make the cut at the European tour four years later. He continued to break records and set precedents until he turned professional in 1999. That year he achieved worldwide prominence thanks to a tense duel with golf legend Tiger Woods, losing by just one stroke. Shortly afterwards he became the youngest player ever to compete in the prestigious Ryder Cup. He’s been a member of every single Ryder Cup ever since – with the exception of 2010. Overall Sergio Garcia has 31 international tournament titles to his name, including the 2008 Players Championship, Mercedes Championships and 2017 Masters Tournament. He has also received a number of awards and accolades over the years – including the Sir Henry Cotton Rookie of The Year in 1999, the Byron Nelson Award in 2008 and the European Tour Golfer of the Year in 2017. 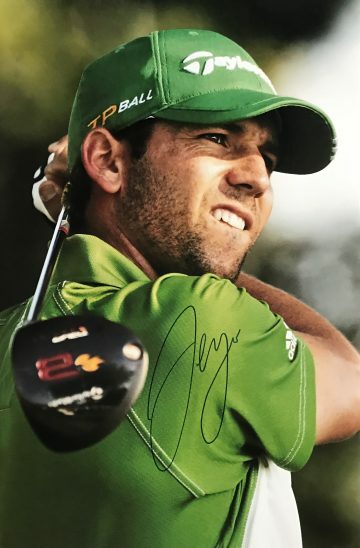 You’ll find a fantastic selection of signed Sergio Garcia golf memorabilia here at Firma Stella. We’ve sourced each unique piece independently – from Sergio Garcia autographed golf gloves and shirts to caps, mounted photographs and commemorative displays. Shop now to complete your collection or invest in a slice of sporting history.